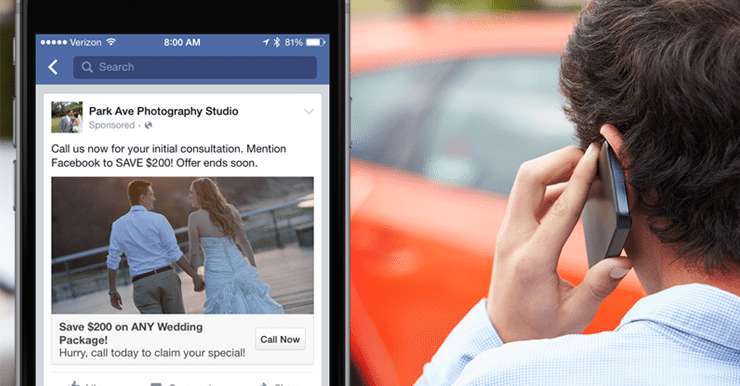 You’re running an ad on Facebook and hoping it’ll result in phone calls to your office. The campaign is running, you’ve spent hundreds, and you’re still not sure how to measure the success of your campaign. You could send your targeted customer to your website and hope they pick up the phone, but how do we measure where they came from? In the middle of May, Facebook quietly updated their Local Awareness campaign objective. Before the update, Local Awareness campaigns allowed a business to target their intended audience via an advertisement with a “Get Directions” call to action button. Now business can choose between a “Get Directions” or a “Call now” button, depending on what makes sense for their ad. Better yet, these ads are only served on mobile, which means pressing the “Call now” button and reaching a representative at your business is a seamless experience. Never worry again about your receptionist asking customers how they found your company. All activity from the ad, including ad impressions and button clicks, can be tracked in real time through the Facebook Ads manager. Keep in mind this ad is only being displayed on mobile devices. With that being said, you’ll want to make sure the image supporting your ad is clear and easy to read when scaled down. You’re not sending people to your website, so make sure your ad clearly states valid points that will drive conversions. Make sure your ads are only running when your business is open. After all, what’s the point in running an ad to drive calls if nobody is available to answer the phone? Like the sound of a Local Awareness that drives calls for your business, but don’t know where to get started? Get in touch with our team today and we’ll be sure to set you up for success! « What’s up with Videos on Facebook?